What road are you on? We all travel on different roads in life, both literally and figuratively. My road is a twisting, winding rural road swirling around mountains and valleys. Sometimes the road is smoothly paved, other times the gravel can easily get the best of you. 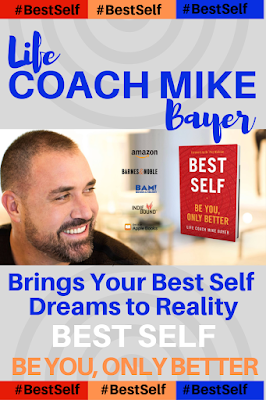 Safety will always be an issue that I stand passionate about addressing and disseminating vital information, as an educator, and most importantly as a parent. 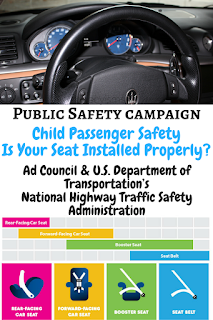 Once again, working in partnership with the Ad Council and the U.S. Department of Transportation’s National Highway Traffic Safety Administration (NHTSA) as part of an initiative to inform parents and caregivers about the importance of properly selecting and installing the correct car seat for children, helping to save lives. Let's take a moment to share this urgent child passenger car seat safety steps for parents and caregivers with our friends and family today! 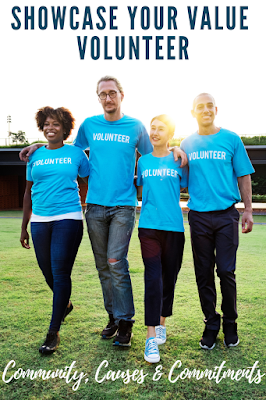 For most of us, collecting our personal belongings and heading out to the car to take care of family appointments, play dates, work and childcare obligations are all part of our regular every day routines. When we are traveling with our little ones, we put them into their car seats and buckle them up without a second thought as to whether or not they are in the right seat to offer the best protection. We trust that they are safe and secured– and we drive off on our way. Unfortunately, that may not be the case for road safety. 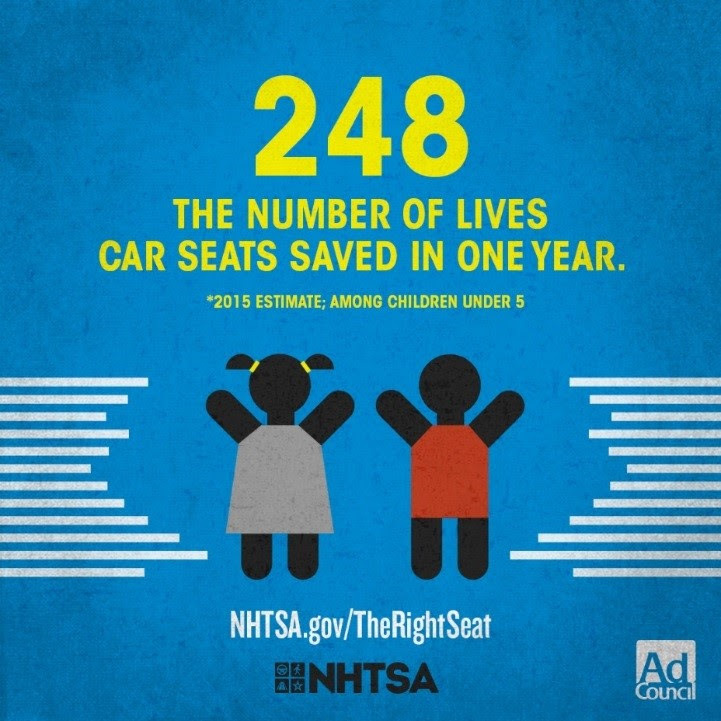 With an increased call to action during Child Passenger Safety Week, we are sharing the message urging parents and caregivers to visit NHTSA.gov/TheRightSeat to determine if their child is in the right car seat for his or her age and size and to locate a car seat check station in their area. Also – Don’t forget to register each child’s car seat with the manufacturer so as to be informed in the event of a recall. 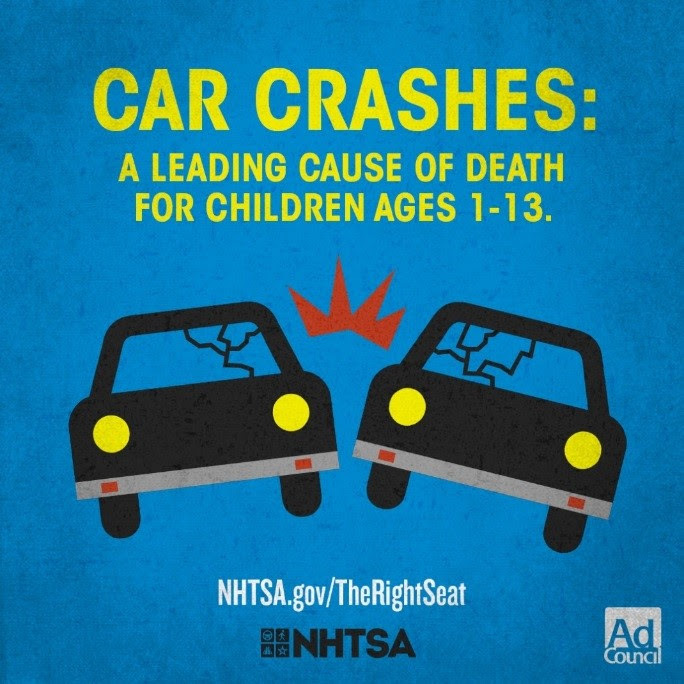 Every 33 seconds a child under the age of 13 is involved in a car crash in the United States. A car seat is no doubt one of the most important purchases will ever make for your child. Car seats, when installed and used properly, can dramatically reduce the risk of fatality or injury in motor vehicle accidents. More than half of children's car seats are inadvertently misused in a manner that may reduce their effectiveness. Sadly, approximately 1 in 3 children killed in car crashes are traveling completely unrestrained at the time of the accident. Can you believe those devastating statistics? 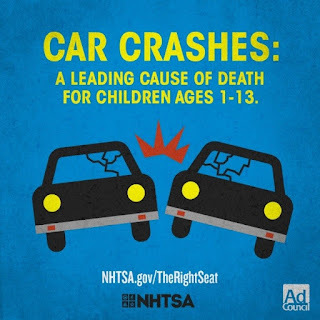 Believing that your child is in the appropriate car seat, only to discover otherwise is a frightening reality to face. How do you decide which type of car seat is the right car seat for your child? Should your child be secured in a rear-facing infant car seat, a convertible car seat, or a booster seat? Finding the right car seat and installing it correctly is an overwhelming task for parents. There's also the vehicle safety question of when to transition your child to another type of car seat to be considered. - Based on Car Seat Types - Learn the facts about the four types of car seats. 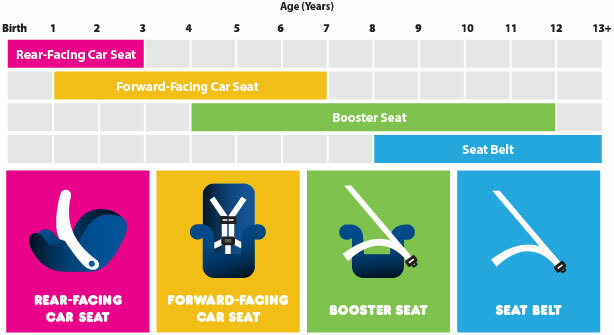 - Age & Size Recommendations (from birth to age 13) - Follow these recommendations for selecting a car seat based on your child's age and size. - Find a Car Seat - Compare car seat makes and models using the Car Seat Finder tool. - Car Seat Ease-of-Use Ratings - Evaluate car seat features using our car seat ease-of-use ratings. - Follow these car seat installation tips to keep your child safe. - Don't delay—register your car seat today to receive car seat and booster seat recall notices. 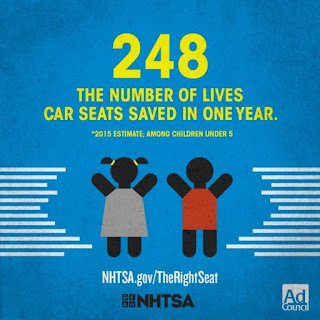 - Sign up to receive e-mail alerts about car seat and booster seat recalls from NHTSA. The Takeaway- Car accidents are a leading cause of death for children from 1 to 13 years old. Many times these tragic deaths and injuries can be prevented by the proper use of car seats, booster seats, and seat belts. 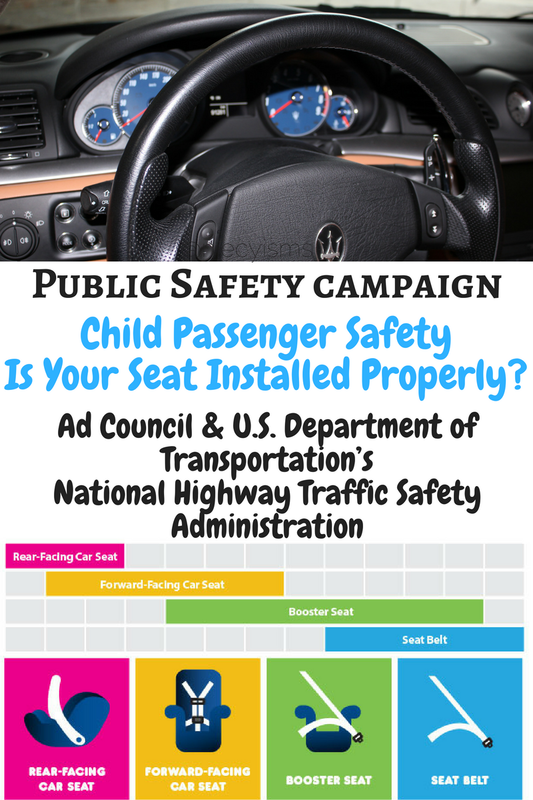 By working together with the Ad Council and the U.S. Department of Transportation’s National Highway Traffic Safety Administration (NHTSA), we hope to share this message that will educate parents and caregivers about the importance of selecting the right seat for their child’s age and size, and to remind them that car seats, booster seats and seat belts offer the best protection for our children in accidents, helping to save lives. 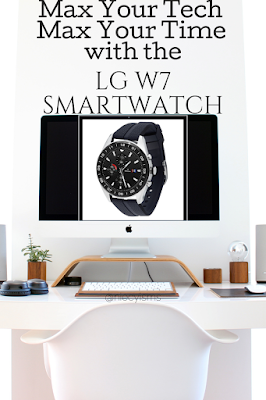 Let's do our parts to share this urgent message with our friends and family right now!